If you had a notion that being bright - and gifted in science & engineering will make you land in the United States of America then you need to wake up. The flight to US has restricted the number of seats available under H-1B quota and has based it completely on a lottery based system. 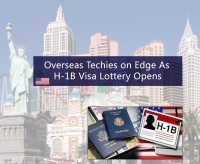 The lottery for H-1B Visa which is issued only to highly skilled workers opened on Monday. It has been expected that nearly 85,000 slots will be filled in a couple of days’ time. It’s being assumed that this year also approximately three-quarters of the H-1B visas will be allotted to the Indian workers. US President, Mr Donald Trump, had been campaigning on an "America First" ideology, which emphasises to "end forever the use of the H-1B as a cheap labour program" and make the organisations to give importance to the American born - job applicants." The US president has earlier also announced to release an executive order to investigate visa abuses. The executive order is still on hold and is yet to be signed. Jeff Sessions, Attorney General; while campaigning for presidential elections for Mr Donald Trump had said that he would insist on eliminating the H-1B visas altogether -- which could be a major set back for the tech companies who rely heavily on the workers from other countries. On 3rd April, the Justice Department cautioned that the hiring practices whichdifferentiate against Americans will be considered as violation of the federal law. The acting assistant attorney general Tom Wheeler, in a statement said that "The Justice Department will not tolerate employers misusing the H-1B visa process to discriminate against U.S. workers. The U.S. workers should not be placed in a disfavoured status, and the department is wholeheartedly committed to investigating and vigorously prosecuting these claims."